I recently watched a documentary about giraffes. I found it quite fascinating, for example, the giraffe is the nearest current animal to the dinosaur. They also have the biological issue of having to pump the blood from the heart to the brain via their long neck going against gravity. However the fact that struck me most, was that giraffes can go with as little sleep as 10 minutes a day. This got me thinking, why aren’t more giraffes working in factories? Big business would love an employee who could work long hours without a rest and I doubt they are protected by a union. Plus they’d be able to get objects from high shelves with ease. Do you lead a dull existence? A teacher friend at work mentioned how an old school friend of his runs a clown agency in Amsterdam. I have a uni friend who is currently living in Laos and another friend of mine has been working in Poland and Germany for the last few months. This may be very exciting but what about people who lead a dull existence? I think we should be bigging these people up. When I say dull existence, I am including myself. My time seems to be split between work and washing up (whilst listening to podcasts). In an attempt to liven up my time at work, I’ve taken to putting a squiggle in the space allocated for my signature in the signing in form. I say it was a march, it was more like a leisurely stroll (whilst carrying a placard) from Parliament Square to Trafalgar Square, approximately 900m, my kind of march. At Trafalgar Square, there were speeches, some music and even a poet. I’m not here to say I’ve eradicated racism, fascism, homophobia, or Islamophobia, but you can only do so much on a Saturday morning. My attendance however was not without personal sacrifice as me being there meant I missed watching the Chelsea v Arsenal game. 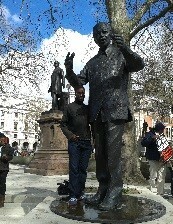 I can only wonder if Martin Luther King Jnr was as committed to the cause.